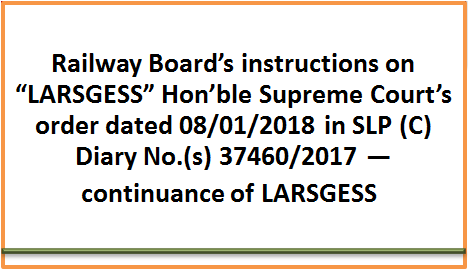 Sub: Railway Board’s instructions on “LARSGESS” Hon’ble Supreme Court’s order dated 08/01/2018 in SLP (C) Diary No. (s) 37460/2017 —continuance of LARSGESS-reg. Ref: (i) Railway Board’s letter No. E(P&A)I-2015/RT-43 dated 27/10/2017. (ii) NFIR’s letter No. II/34/Part 16 dated 08/11/2017 & 15/11/2017. (iii) Railway Board’s letter No. E(P&A)I-2015/RT-43 Pt-I) dated 30/11/2017. (iv) NFIR’s letter No. II/34/Part 17 dated 08/01/2018, 09/01/2018 & 19/02/2018 addressed to Board (CRB, MS etc). (v) NFIR’s letter No. 11/34/2018 dated 20/03/2018, 18/04/2018, 28/04/2018, 30/05/2018, 05/07/2018 & 24/07/2018. NFIR has been repeatedly pressing the Railway Ministry in general and Hon’ble MR & CRB in particular to arrange to look into the LARSGESS in depth for continuation of the Scheme. While the Hon’ble MR has assured and issued directives to Member Staff on 04th April, 2018 to explore way for keeping the Safety Scheme intact and also appointing those wards of safety staff already selected (as on 27th October, 2017 and waiting for appointment), the Railway Board is yet to take decision. NFIR further brings to the kind notice of the Hon’ble MR that the Hon’ble Supreme Court had passed order, directing the Railway Ministry to re-visit the Scheme and take conscious decision. While this is so, keeping larger public interest in mind and equally safety of staff who perform critical nature of duties, the Railway Board could have taken conscious decision for the continuance of the Scheme. Incidentally, it is mentioned that the LARSGESS was conceptualized as replacement to SRES in the year 2004, keeping in mind the larger public interest, safety of assets and workforce and not to dole out unintended benefit to the specified safety category staff. NFIR strongly believes that the Railway Ministry is competent to take independent decision consciously due to reason that larger public interest is involved, particularly considering the fact that over 2 crore people travel by trains every day throughout the year and their safety is the primary concern of the Railways. NFIR feels sad to mention that the Railway Board has been hesitating to take bold decision keeping in mind the public interest as well legitimate interest of safety staff. It needs to be appreciated that for performing certain jobs directly connected with safety, the staff meant to perform the said duties are not able to give desired results due to age factor wherein level of alertness besides ability for quick response deteriorates and when such staff gives willingness to retire under the safety Scheme, the Competent Authority takes decision to allow him to retire and induct his ward who happens to be young, more capable to perform more efficiently. This is an incentive provided as the safety staff although have done yeoman service have reached a stage due to age factor, not able to perform to the expected standards, the only way is to retire him on his request and provide employment to his ward. NFIR feels that there are no aberrations in the LARSGESS when the management looks into the Scheme, keeping larger public interest in mind. 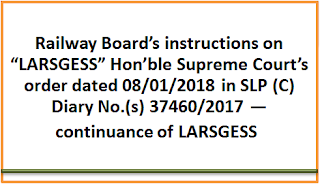 NFIR, therefore, requests the Hon’ble MR to kindly advise the Railway Board to take positive action facilitating continuance of LARSGESS. NFIR also requests the Hon’ble MR to direct the Railway Board to grant appointment to those wards of safety staff already selected on the date of issuance of Board’s letter dated 27th October, 2017, advising the Zonal Railways to keep on hold the Scheme. LARSGESS was conceptualized as replacement to SRES in the year 2004, keeping in mind the larger public interest, safety of assets and workforce and not to dole out unintended benefit to the specified safety category staff.